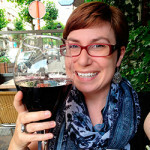 Our 19th “Follow them Friday” features Alison from Cheeseweb blogging in English. I started blogging on January 7, 2004, which means I celebrated the 10th anniversary of CheeseWeb this year! It’s hard to believe. It was pretty random actually. We were living in the Netherlands at the time and, of course, North Holland is famous for its cheese and clogs. Originally, I was going to call the website the ‘cheese and clog blog,’ but I soon shortened it to CheeseWeb. Years later, I toyed with changing the name to something more relevant, but so many readers wrote in asking for me to keep it, CheeseWeb remained. I really enjoy both. I love to cook, but I adore discovering new restaurants all the way from street carts, to Michelin Stars. I can’t say I have one particular dish, but I like sharing my love of regional Indian food with others. I’ve been known to whip up a seven dish curry feast on occasion and it’s always something different. Again, this varies. Any time of curry is certainly a comfort food for me, as is sushi. Lobster really reminds me of home (my Eastern Canadian home, that is) and I love a great bowl of pasta. I definitely prefer savory to sweet, but I love a good moelleux au chocolat or a nice tart sorbet. I’m not much of a breakfast person, but if we do go out for brunch, I enjoy an egg/bagel sandwich, or failing that, an omelet. Again, it was my desire to learn more about regional Indian cooking that really sparked my passion. My first foray into Indian ‘cuisine’ was making Madras curry from a jar in university. I had no idea I’d end up toasting and grinding my own spices some day to make curry pastes from scratch. I was actually a super-picky eater as a child (just ask my Mom). I lived on chicken fingers, hot dogs, hamburgers, and grilled cheese sandwiches. Am I ever not blogging? I live to travel, photograph the world, eat, read great books and spend time with my wonderful husband and our two cats. Why each and every one of the Brussels Food Friends of course! How lovely to be mentioned here by Alison! Truth be told, Alison was one of the first bloggers I connected with in the real world. At the time, I was living in Brussels and her reviews and tips helped me explore the place more than I would have alone.